I am back with another interview with another great amigurumi designer. Missed the other interviews? Make sure you read about the designers Mevlinn, Melissa, and Alyssa. All of them are also taking part in the 2016 Ami-Along, which runs until the end of August. Today, meet Justyna of Cute and Kaboodle. You can find her designs on her website, Ravelry and Etsy. Hope you enjoy learning all about her and her design process. Justyna: It was in 2011 when I wanted to open an Etsy store selling crocheted toys and didn’t want to use somebody else’s patterns. Designing turned out to be so much fun that I started selling patterns instead of toys and now I can’t stop! Me: You have such a variety of patterns, including amigurumi, bookmarks, shawls, ornaments, tape measure covers, pouches and cases, even a bath puff. How do you decide what to design next? What inspires you? Justyna: Oh no, I never sketch! I’m terrible at drawing and the toy never looks on paper like I imagined it in my head, so, in my case, it’s a waste of time. I usually just try to think about what I’d like to make, get the perfect yarn for it, and start. I usually don’t know how big it’ll become when I’m done because there are lots of decisions I make in the process. To me it’s like a great adventure, as I’m never sure what it’ll become. Me: You are the founder and original organizer of the Ami-Along. How did you come up with the idea and get it started? Justyna: I run a group on Ravelry where I try to organize some games and CALs often, but I know that in the summer my time is limited and I’m not always available. I thought other designers might have the same issue, so I thought it would be a good idea to team up for the summer and organize something together – this way, you can have stress-free vacation time because you know your fans and followers have a fun activity to take part in. Even when you’re not there, there are other designers who will be there for them. Plus, when you’re back you’ll be the one who’s helping participants work on other designers’ patterns when they’re away. But it turned out to be so much more than just a summer break and I love it! I hope we will continue organizing it for many years in the future. Me: I noticed a few of your patterns come in both a knit version and a crochet version. Are they originally crochet patterns and you convert them to knitting, or vice versa? Is it challenging to make the conversion? Justyna: There’s no rule here 🙂 Sometimes I come up with a crochet version and I’m asked to create a knitted one and sometimes the other way around. I mainly crochet, however, so it’s usually the crocheted toy that is the first one. As I mentioned, I sometimes just know that this or that toy says “knitted” or “crocheted” and that’s the original. If it’s popular enough for “the-other-craft-people” to start asking for a different version, I usually do that. It can be challenging, but that’s the type of difficulties I like, so I see it as something fun to do. Justyna: That’s probably the most difficult question! Since most of my designs have eyes and can give me a bad look when I don’t mention them here, it’s really hard to decide. I guess I try to treat them all equally, but I’m really happy how Swinging Kitty Ornament turned out and I love how the Sheep Tape Measure combines cuteness with usefulness. I could go on and on about how each of them is special, but I already feel like I’m talking too much! Justyna: That would probably be the schnauzer when it comes to amis, and the owl mug cozy for non-ami patterns. Oh, and while we’re here, I Promise You Pineapples shawl is also popular. These are definitely the ones downloaded most often. Justyna: Time! I guess it’s every freelancer’s nightmare – too little time for everything. Since we usually work at home, there are no clear work/home boundaries and finding balance can be tough. Justyna: Pay attention to the actual writing of the pattern. Making an item, whether it’s a toy or a sweater, is the easy part. The most difficult task is writing your idea down clearly and easily for your customers to understand. Also, always test your patterns, no matter how many times you read your pattern, a fresh set of eyes (and hooks!) always see more and will help you improve the pattern for sure. Justyna: Not to be afraid, I guess, they’re usually just single crochet stitches! It’s also important to start with a hook that matches the yarn – you don’t want holes in your amigurumi, so don’t pay much attention to what the yarn label says, but make your own swatch with a hook a bit smaller than recommended and check if there are holes. Also, try different eye placements before fixing the eyes and see which you like best, as the position of the eyes has a tremendous effect on the final look of the amis. Thank you Justyna for sharing your story with us! If you decide to make some amis using Justyna’s patterns, make sure you enter them into the Ami-Along for your chance to win prizes! It will be running until the end of August 2016. Now that the 2016 Ami-Along has begun, I thought it would be a good idea to bring back the designer interview series and talk to some of the designers involved in the CAL/KAL. If you missed the last interview, make sure you check it out, because it is with Mevlinn, another designer taking part in the Ami-Along! 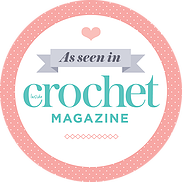 Today, meet Melissa of Melissa’s Crochet Patterns. You can find her designs on her website, Ravelry, Craftsy, and Etsy. Hope you enjoy learning all about her and her design process. Melissa: I am a 29 year old Mom and Wife. I recently started working at a school as a yard teacher, although I am going to pursue going back to school to become a teacher. Melissa: My first pattern was published November 2011. My daughter really loved My Little Pony and at the time there were no crochet patterns for one so I decided to make one myself. Being a crochet pattern designer has been a lifelong dream though. Me: You have so many patterns (>150)! With so many now, do you find it difficult to come up with new designs? What inspires you? Melissa: Absolutely not! I get inspiration from things that I see everywhere, movies and shows I watch with my kids, stuffed animals I see in stores, or sometimes things that just pop into my head. Melissa: Very rarely do I sketch something out. Most of the time I go from what is inside my head. Melissa: My current favorite has not been published yet, an ocelot from Minecraft. My son is in love with these cats and has 3 of these stuffed animals. For over a year he carries them wherever he goes. I have been wanting to create a crocheted one, but it took me so long to decide how to do it. Once I finished her I wanted to cry of joy. Melissa: Right now my most popular pattern is BB-8 from Star Wars. Melissa: I am surprised how popular my new pattern Baby Bears got so quickly. I made them for some of the kids at the school I work at. I just wanted to make it quick and simple so I had time to make as many as I could. Melissa: Sometimes trying to explain the right way to make a specific crochet pattern can be challenging. Putting things into words can be a little difficult at times. Melissa: Go for it and never give up! Your first crochet pattern may not be so wonderful, but you have to keep trying. With every crochet pattern you make you will get better and better. Melissa: I recommend watching some youtube videos, they are extremely helpful. This is actually the way I learned to make amigurumis. Melissa: I am very active in my Ravelry Group, I have Show and Tell Sunday on my Facebook page, or you can send me a message anytime! Thank you Melissa for sharing your story with us! If you decide to make some amis using Melissa’s patterns, make sure you enter them into the Ami-Along for your chance to win prizes! It will be running until the end of August 2016.